Defcon, the hacker and security conference, is coming to Caesar's Palace this weekend (I'm speaking! ), and that means that the hotel needs to start thinking hard about the security of its systems, likely to be targeted both in earnest (by people who want to spy on attendees) and in jest (by attendees who want to prank their fellows by announcing that they've compromised everyone's systems). 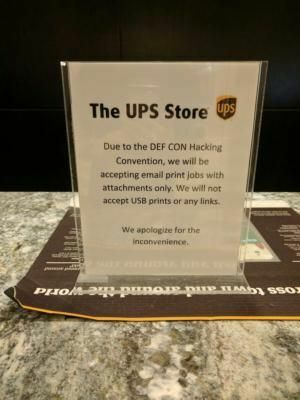 That's why the UPS business center at Caesar's has announced that it will only accept print-jobs as email attachments, and not as links or via USB sticks. It's a reasonable mitigating measure, but of course, dodgy attachments have their own (often severe) problems. Unless absolutely necessary for a job function, disable Wi-Fi. If Wi-Fi is absolutely required, ONLY use your own provided Wi-Fi. I used a JetBack/MiFi and connect ONLY to that device. Always use a VPN as soon as you obtain Wi-Fi access. Do not plug any USB storage devices (hard drives, sticks, network adapters, Raspberry Pi’s, etc.) into the laptop or phone.